The Phota program was originally developed to replicate photo albums as close as possible on a computer screen. In truth though, an interactive photo album has the potential to do much more than any physical photo album, and Phota has evolved to become a fairly full-featured image display and management application. Audio and video sequences can also be incorporated into Phota albums. <= Click this miniature screen sample to view a full-size image. The primary emphasis of Phota is to exhibit a collection of photographs in the most attractive way, and to provide flexible tools for quickly and easily creating such albums. It is an ideal application for people with digital cameras, who wish to immediately enjoy their uploaded images, without spending much time and effort in creating and formatting albums. The Gallery feature exhibits a collection of photos in dynamic 3D perspectives. 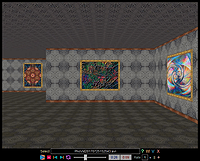 Explore can be activated to automatically stroll through a Gallery, pausing before each image to admire it, and then on to the next photo, until a door to the Next Gallery is reached and passed through. A Navigation Bar contains most of the controls needed for the basic operation of Phota. Creating an Album is very simple, with screens that guide you through the process. Photos on album pages can be clicked to display full-screen images. Left and right arrow keys can then be used to scan back and forth through full-screen photos. Click again to return to album page display mode. The Add Photos option allows images from one or more directories to be loaded into an album very quickly, either by selected groups or all at once. Photo Description items can optionally be automatically filled in with appropriate IPTC and/or EXIF fields. Album pages can also be easily copied from the same album or merged from other Phota Albums with the Copy Album Pages feature. The Albums Catalog provides a handy index and summary of your Phota albums. Options are available to quickly open albums, browse through album pages and list album photos. A Photo Index feature lists Title, Photographer, Date, Location and Occasion information for all of the photos in an album. An individual photo in the index can be clicked to display a thumbnail image. Buttons are available to display a full-screen image and show Photo Information for a selected photo. Pressing another button will skip to the album page on which a highlighted photo occurs. Album descriptive information, including Title, Author, Category, Time Period and Comments, can optionally be displayed on the first page of a Phota album. Intro Audio and Intro Video clips can optionally accompany the Album Description. An album can contain virtually an unlimited number of pages. Photos are automatically sized within a page to most efficiently use the available screen area, based on the current page layout and display options. Each photo can be annotated with Title, Photographer, Date, Location, Occasion, Keywords and Comments. Photo Info buttons can optionally appear beside each photo on an album page to allow quick access to Photo Information. Audio and Video files can be associated with each photo. The Photo Information screen also provides convenient access to any IPTC and EXIF Data that is encoded within image files. Both the Photo Information and the Mass Load Photos screens provide options for loading Photo Description items from relevant IPTC and/or EXIF fields. Using Photo Search, an album can be quickly scanned to list any photos that contain a specified text value within their descriptions. Optionally, all albums in the Albums Catalog can also be searched. While using the Format Mode feature, convenient controls for page and photo manipulation are available along the bottom of the screen. Images within the current page can be rearranged by clicking and dragging them with the mouse. A versatile Page Designer screen provides options for adding and deleting pages, inserting and removing photos, moving photos between pages and other page formatting functions. 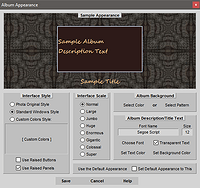 Phota Album Appearance can be customized to suit individual tastes, including the overall interface style and scale, the text font type, size and color, and color or pattern of the background that surrounds displayed album pictures. The Phota Menu and Photo Info buttons can be removed to maximize screen space for displaying images. A Popup Menu, accessed by right-clicking the mouse, includes all of the same options as the Phota Menu, and provides an alternative means of accessing these functions when the menu has been removed. Titles can optionally be displayed beneath each photo. The Audio Player can play most common Audio file formats, as well as Audio CDs. The Video Player can play most common Video files. Animated Phota scenes can be captured to AVI or WMV Videos, or as sequences of still image files, according to Video Options parameters. 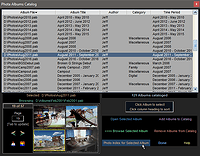 An Image Sequence Player is also available to play Image Sequences as animations, and record those animations as Videos. Album pages, individual photos or Gallery scenes can be printed, and can also be set as Wallpaper for the Desktop background. 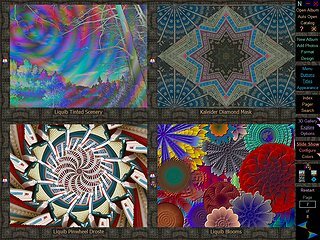 The Animate Colors feature performs a continuous series of color shifts on the pixels of displayed images based upon parameters configured through the Animate Colors Options screen. The available Colorize Methods are Garish, Iridescent, Neonic, Opalescent and Contusive. The Page Up and Page Down keys can also be used to step forward and backward through the color shifts one at a time, (whether or not Animate Colors is active). The Slide Show feature allows album pages or individual photos to be displayed automatically, in sequential or random sequence, with a specified time interval between displays. 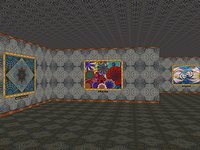 Alternatively, a Slide Show can be set to use Explore Galleries mode to exhibit the album in a 3D environment. The Animate Colors option performs a sequence of color shifts on the images and/or background of Slide Show displays. Options are available to control how Audio and Video sequences are incorporated into the Slide Show. The Phota Screensaver and an interactive Phota Viewer can be freely distributed with Phota albums composed of your own photos. 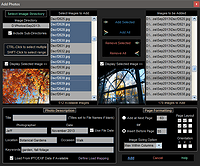 The free Phota Package Builder program can be used to create Screensaver and CD/DVD installation packages.